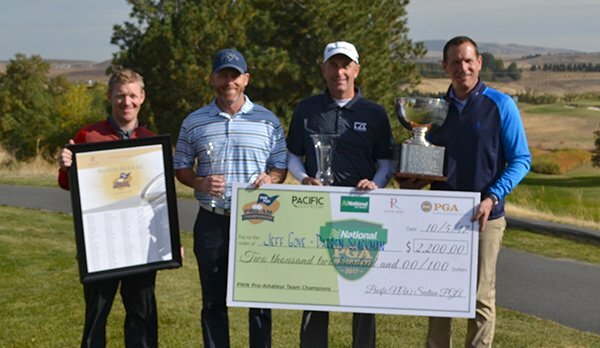 The team of PGA Professional Jeff Gove with amateur Darren Slackman of The Creek at Qualchan won the PNW Pro-Amateur Championship by two strokes after firing four-ball scores of 61-61-122, 22 under par. They won by two strokes over 2011 Champions Brian Thornton of Meridian Valley CC and amateur Todd Densley. CLICK HERE to view the Pro-Amateur Championship results. It all started when a young head professional named John Junor and his amateur partner won back to back titles at the magnificent Seattle Golf Club in 1924 and 1926 (no championship in 1925). Professional Walter Pursey and amateur Harry Givan topped Junor in the late 30’s with a three-peat victory at Seattle GC twice and Alderwood GC once. As the years went on, many great players etched their names into the record books as champions of this event. Long time professional Don Bies and his partners have seen numerous championships winning three of them in 1961 at Glendale CC, 1964 at Seattle GC, and in 1966 at Yakima CC. Other greats such as Bunny Mason (1963) and Jerry Mowlds (1969, 1978) have all had their share of the title. Designed by the late John Harbottle III and carved into a broad expanse of rolling hills on the Pullman campus of Washington State University, Palouse Ridge Golf Club is one of America’s finest public-access courses. This majestic 7,308-yard layout takes players on an unforgettable journey through “the Palouse,” its undulating dunes a legacy of the last Ice Age.